What type of spells do we know? Or do we only have telekinesis? Welp, guess we're staying here right now. Can't really try to escape until Hran can move. You can do a magic spark, players haven't really tried anything else. But you are not very skilled in magic. 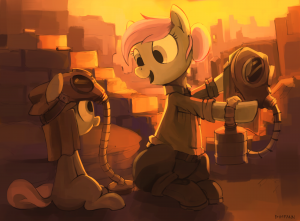 How could you learn much more as pony employed in retail before the war. >Fleeing might be truly difficult now, you've thought. >Hranchak couldn't move for some time. He had to recover before you could take even first steps towards escaping. >Also you should talk to both your companions about it, and initiate Hran into this issue when he regains his consciousness. >You didn't saw him fainting, he must've passed out when you were in bathroom. >You trotted to the kitchen, both Clean and Kalina were enjoying some soup. Your friend gave you a smile and old mare patted your side. >"So, how's Hranchak?" they said in unison. "He needs to recover, but he'll live. Nothing too nasty happened." >"Uff" you heard Kalina "This is truly a relief, you lifted some weight from my heart. Thank you, sweetheart." >"We've heard your conversation with these guys" said Cushions after a while of relative silence. "What we're going to do? I wanted to stay home, everything I have is here." >"I don't know what to say. I stayed in my country for whole war, but left soon after it collapsed. It's economy went straight to the trash and it's citizens became poorer and poorer." >"Anyway, where could we possibly go? When TV was working I saw that frontline was way down south from Fillydelphia" your friend was sceptical. All of a sudden she did a facehoof and raised from her chair. "Silly me, you must be starving! Here, have some soup"